The Martian is the film that Interstellar should have been. A rousing, surprisingly funny, and touching space adventure, Ridley Scott has delivered his best film since Gladiator. Matt Damon stars as Mark Watney, a botanist on the Ares mission to explore the surface of Mars. Caught in a sudden storm, the mission commander (Jessica Chastain), gives the order to evacuate. The astronauts lose Watney when he is hit by the communications array and covered in debris. His bio-signs dark, they assume he is dead, and rocket back to the orbital ship. Heartbroken and with the mission a failure, they begin the long journey back to Earth. Watney regains consciousness, terribly injured, and abandoned. Pure luck kept his space suit from decompressing. What follows next is stomach churning self surgery. Then a cold realization as to the dire nature of his situation. It will take years for a rescue mission to reach him. He has no way of communicating with NASA. There is limited, food, water, and oxygen. The situation seems hopeless. But the human spirit, the will to survive, is fierce. Watney embarks on an ingenious plan to grow more food. Which in turn will create water and atmosphere. As Watney works on his ambitious project, observers at NASA back on Earth notice that equipment on Mars is being moved. They quickly deduce that Watney is alive. But even if they regain communication. How could he possibly survive long enough to be rescued? The Martian is like Cast Away wrapped in Apollo 13 and The Right Stuff. You have the primary story of Watney and his travails on Mars. Then subplots of the NASA scientists, led by William Hurt and Chiwetel Ejiofor, engineering solutions to the crisis. While the team in space wonders how they can help in the rescue. Based on the bestselling book by Andrew Weir. The Martian is about hope. The idea that the most insurmountable problem can be solved by the sheer will of humanity. In a time where almost everything we see from Hollywood drips with pessimism. 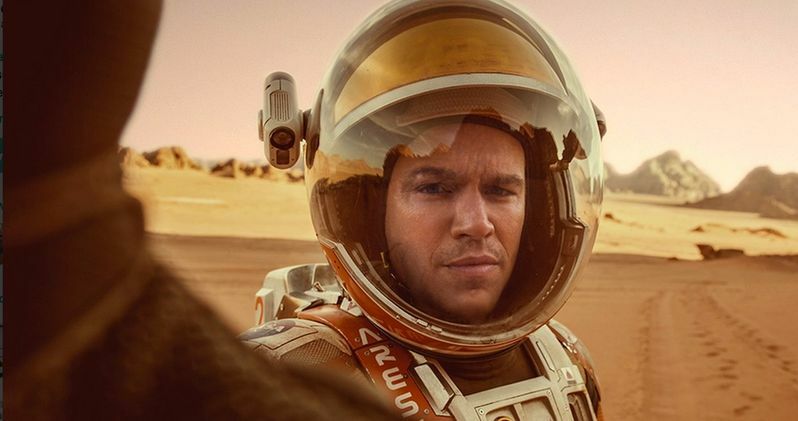 The Martian embraces a boldness of vision and optimism. It features a global response to Watney's predicament. Where the finest minds of all creeds and cultures lend their best to boost his chance for survival. Matt Damon is truly a one man show here. The vast majority of his scenes are alone. Creating video log entries to methodically document his activities, and preserve his sanity on the barren planet. While he deals with depression and loneliness, Watney's character is whimsical and thoughtful. He sees humor in the darkness of his plight. This is the most pleasant surprise of The Martian. It is really funny. I was astonished to be laughing so hard throughout the film. The successful blending of humor with the action and adventure is another fantastic achievement by Ridley Scott. He is a legendary director, but I'm pretty sure no one would bring up comedy in his repertoire. Until now. The Martian marks an evolution in his work. By avoiding foreboding and concentrating on a lighter approach, he makes The Martian a feel good experience. Some may criticize that the film is too optimistic, with not enough realism, or techno-babble. I think the vast majority of audiences will be won over. There's nothing wrong with leaving the theater with a smile on your face and bounce in your step. The Martian is an inspiring film that the entire family can enjoy. It portrays space exploration as a daunting frontier that can be conquered by the courage of man. You just might find yourself with a little groove in your step after watching. The soundtrack is loaded with seventies disco, the only music that Watney has during his odyssey on Mars. It seems that Donna Summer's owns the interplanetary nightlife as well.